A permanent museum is to be created in a bland office space in a London attic. They are rooms that rock music pilgrims have been pleading to get into for decades – the rooms rented in the late 1960s by Jimi Hendrix, poignantly described by him as “the only home I ever had”. Hendrix, born in Seattle, and regularly voted the greatest guitarist of all time, was almost unknown when he first came to London in 1966. Word soon spread in the music community of his extraordinary talent. On one night his audience included John Lennon, Eric Clapton, Pete Townshend and Mick Jagger. The following year his debut album, Are You Experienced, with his band the Jimi Hendrix Experience, which included the tracks Purple Haze and Foxy Lady, made him an international star. Although most of Hendrix’s last years were spent touring he returned to make London his base in 1968, and the Brook Street house is his only surviving home. Although many have assumed Hendrix knew nothing of the Handel coincidence, he was fascinated to learn of his distinguished predecessor, and headed off to One Stop Records in nearby South Molton Street to buy music that Handel wrote while living there, including the Water Music and the Messiah. Some critics have even claimed to detect Handelian riffs in the thunderous guitar chords of later Hendrix work. Handel died in 1759 in his bedroom in the house. 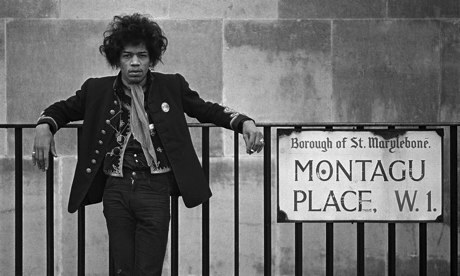 Hendrix died in 1970, aged 27, in a Notting Hill hotel. His death was probably caused by choking after an accidental drugs overdose, although conspiracy theories abound, with some claiming it was suicide or even foul play. At Brook Street, the Handel House museum was established in 2001 after the former tenant, a building society, moved out. The museum managers have got used to a steady procession of visitors who are often startled to learn that another musician shared their hero’s space. The Georgian interiors that Handel occupied for almost 40 years, paying £60 a year for the entire house, have been meticulously recreated, but Hendrix’s rooms, long since stripped of period detail, had become the offices of the museum staff. Occasionally the staff gave in to pleas and allowed reverent pilgrims from the far side of the world, visiting musicians, or VIPs at private receptions, to peer in at their filing cabinets and swivel chairs. When the rooms went on display for a few hours during annual Heritage Open Days, places were booked out instantly, and a one-off exhibition in 2010, marking the 40th anniversary of his death, was packed out. During the exhibition the staff had to move their desks and computers into service corridors and cubbyholes all over the building, but the grant will allow them to leave the Hendrix rooms and take up residence permanently in alternative office space. There will also be an education space and an expanded education programme spanning baroque to rock music. Wesley Kerr, chair of the London committee of the Heritage Lottery Fund, said the sum of the two spaces was greater than their parts.